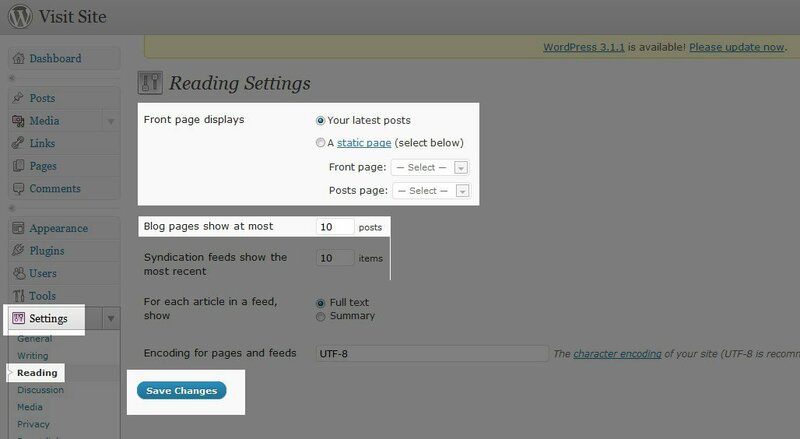 WordPress allows you to control what appears on the front page of your website. The most common settings changed on the home page is typically how many posts display, and whether your website shows recent posts of static content such as a page you have created. To make changes click "Settings" in the left menu then the "Reading" sub menu. The "reading" sub menu contains different seettings you can make to your website. "Front page displays" is the option where you decide if your home page is a static or dynamic page. Remember, a dynamic page loads your blog posts and a static page is one of the pages you have created. "Blog pages show at most" is the option that allows the administrator to choose how many blog posts display on the home page. Click on save changes when you are finished and you are done modifying the settings of your home page. My Homepage ("Mission Page") is displaying my blog posts.